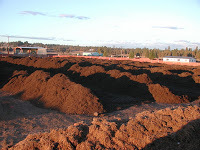 Deschutes County’s compost pile occupies about six acres at the Knott Landfill. BEND, OREGON — Deschutes County’s newly formed Solid Waste Advisory Committee is looking at ways it could expand the county’s food waste collection program in hopes of extending the life of its landfill. The move would put one of the country’s fastest growing localities on a long list of places that offer both residential and commercial food waste disposal services. It could also force the county to build a brand new solid waste facility in a remote area where no one would object to the smell. Deschutes County’s population grew from an estimated 180,675 residents in July 2016 to 186,675 in July 2017 according to the U.S. Census Bureau. This 3.4 percent year-to-year increase made the Central Oregon county the nation’s fourth fastest growing locality – a status the county could hold well into the future as its population is projected to reach 190,000 by 2020, 210,000 by 2025, and 230,000 by 2030. The county’s rapid growth rate along with its status as a popular tourist destination capable of attracting 100,000 visitors each month have brought the county-owned Knott Landfill close to capacity. The southeast Bend solid waste facility has seen an 11 percent increase in its solid waste disposal operations each year since 2015 and will likely close by 2029. These predictions prompted the Deschutes County Board of Commissioners to create a 12-member solid waste advisory committee that hopes to find ways it could increase the county’s solid waste recovery rate from 33 percent to 45 percent over the next seven years. The group recently identified two strategies city staff called “low-hanging fruit” – expanding the county’s food waste collection service and separating its construction and demolition waste from the main solid waste stream – that could help the county reach this goal. Nearly 22 percent of the municipal solid waste sent to landfills and incinerators across the Unites States each year is food scraps that could be composted and used in gardens or to enrich the soil according to a recent study conducted by the Massachusetts Institute of Technology. That’s why it’s no surprise 46 of the 110 mid-sized localities – places with a population between 100,000 and 1 million – the study’s researchers surveyed had some type of a food waste recycling program in place. The study’s researchers found the number of localities implementing a food scrap recycling program had doubled between 2010 and the study’s publication date in 2017. The net effect of these programs had doubled a well, according to a study conducted by the Environmental Protection Agency that found the amount of food waste successfully recycled in the United States – and thus diverted from the country’s landfills – increased from 2.7 percent in 2010 to 5.1 percent in 2017. Franchised haulers in Deschutes County currently offer food waste recycling in an optional yard waste recycling bin. Staff believe that Deschutes County could benefit from a stronger food waste recycling program. SCity staff estimate 42,701 tons of food scraps entered the county’s solid waste stream in 2016. Only 818 tons of this waste – less than 2 percent – was diverted the county’s compost pile where it could be recycled. Fixing this problem alone could raise the county’s overall recovery rate by four to five percentage points according to a presentation by Doug Drenner, a consultant with the solid waste management design firm JRMA, gave during the solid waste advisory committee’s April meeting. But there are some challenges as well. First of all, Drenner said, the county’s compost pile – which handled nearly 27,000 tons of yard waste in 2016 – is not certified to non-vegetative food waste items like meat and dairy products. This means the county would either have to place more stringent controls on its compost pile to prevent any possible impacts the expanded program could have on human health or make sure its residents knew what was permitted and what was not permitted. The other obstacle to an expanded food waste program touches on the very reason why it’s needed. According to the meeting’s minutes, there’s been a significant amount of new residential development surrounding the Knott Landfill and the county’s existing compost pile. “There have been odor complaints,” the minutes read, acknowledging the fact the county may need to build a new compost pile, or haul its food waste outside the area, if it wants to truly see the benefits from an expanded food waste recycling program.